Jesus’ command to “Follow Me, and I will you fishers of men” (Mt. 4:19, Mark 1:17) is set in context to the great commission to make disciples (Mt. 28:19). “What should those words mean to us today as Seventh-day Adventists with our understanding of the three angels’ messages? How much 'fishing for men’ are we really doing as opposed to just 'tending to our own boats’”? The questions asked expose the Seventh-day Adventist Church’s unique understanding of Revelation and how they see themselves in relation to the rest of the world. The SDA church relies on the three angels’ message as a means to identify themselves as the true remnant church of the last days. They see themselves as the fulfillment of each angel’s message. They have the spirit of prophecy (Ellen G. White) who has given them the truest “everlasting gospel” to proclaim to the nations; they are the remnant church that has left Babylon (Roman Catholicism); and they are the commandment-keepers of God who keep all His commands (most specifically the Sabbath). 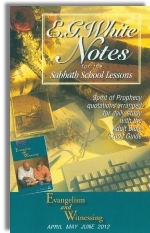 However, it is important to note that while Adventism uses Revelation 14 to distinguish themselves as the remnant church with the “everlasting gospel”, the distinctives (Ellen White, the Investigative or Pre-advent Judgment, and the Sabbath as the seal of God) they add into those passages are qualifiers as to why they believe they are the remnant; they are not the gospel itself. Unfortunately though, Adventism has made these distinctives (the doctrine read right into the passage when it doesn’t exist) to be synonymous with the “gospel”. The gospel shift is subtle, but it does turn the “everlasting gospel” of Jesus saves (Rev. 14:6) into a different or false gospel; turning the focus away from Jesus to their own unique status as a group. Using the three angels’ message as their spring-board for evangelizing the everlasting gospel reveals the motivation behind Seventh-day Adventist evangelistic efforts. The motivation is to bring the “lost” to the truth of Sabbath-keeping. Adventists see the “lost” as those who worship God on Sunday. These Sunday worshippers, as they interpret Scripture, are “Babylon” because they understand Sunday worship to be rooted in pagan Rome (Sun god) and the Roman Catholic Church changing Sabbath to Sunday; not in celebration and as a memorial to Christ’s resurrection and therefore the believer’s new life in Christ (through His death and resurrection). As a result of this unique or distinct understanding, the greater emphasis of Seventh-day Adventist’s evangelistic efforts are geared toward proselytizing to anyone who doesn’t keep the seventh-day Sabbath which would include many already born again Christians who attend church on Sunday. Their concern is that most professed Christians are Sunday Sabbatarians, not seventh-day Sabbath worshipers of God; thus Sunday worshippers will receive the mark of the beast. This is the third angel’s message as SDAs interpret it—worship the beast (on Sunday) and receive the mark of the beast. Or, keep the commandments of God (observing all His commandments including the true seventh-day Sabbath) and receive the seal of God. Adventism’s evangelistic efforts are not hampered by lack of training, but instead by the motivation behind their efforts. The gospel according to Adventists is focused on commandment-keeping, most specifically seventh-day Sabbath-keeping, not the good news that Jesus alone saves. Their goal is to bring the lost to the seventh-day Sabbath truth. So, while Adventism sees themselves as the remnant church, uniquely qualified to share the everlasting gospel to a lost world, they in fact share a false gospel with the world. Their “gospel” is distinctives (the Spirit of prophecy, Ellen G. White; an investigative judgment of works for the righteous; Sabbath as the seal of God, etc.) that draw attention to themselves instead of to Christ alone. Training for evangelism becomes a moot point when the goal of the efforts is anything other than Christ, the very good news of the gospel. Pointing people to Christ, the gospel message that Jesus alone saves, is the only answer. When we accept Christ as our Savior we are given the indwelling Holy Spirit. He (in us) is our greatest witness of Christ (Acts 1:8) and His efforts will not be thwarted. When you have the great news of Christ in you—you can’t keep quiet. You want to shout the good news from the rooftops! 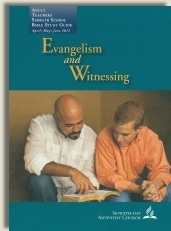 Evangelistic training then takes on different purpose and meaning. It is no longer about goals, efforts and marketing strategies but rather joining with the will of God to share the good news of Jesus with the lost.